Here at Kangovou, we care about your children’s food. We focus on providing your family with the superior, healthy, non-toxic way to store and transport food. However, what you pack your children’s lunches in is just as important as the lunch itself. Packing healthy meals in Kangovou dishware ensures your kids eat healthy always. 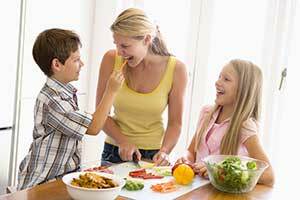 Together, you and your children can quickly prep healthy lunches to encourage healthy diet habits and bond over the positive intimacy of healthy cooking. 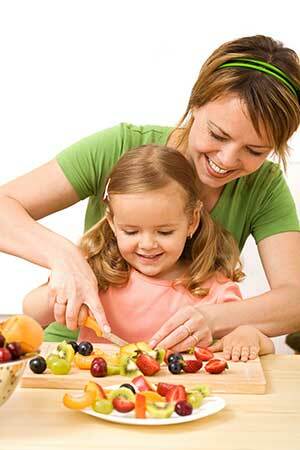 Here are a 10 yummy, healthy meals that can be easily prepped and packed in your child’s lunch. Stay fresh with this wrap! Made with a wheat tortilla and stuffed full of avocado, turkey, and tomato. This crisp, colorful wrap fits perfectly in our Kangovou Compartment Plate, so you can also pack healthy, complimentary sides. We suggest sliced cucumbers and carrots paired with compartment of creamy dressing for dipping, as well as blueberries for a nice dessert! Make lunchtime fun with this easy-to-prep meal! Together, smash some chickpeas into olive oil and sprinkle in some cilantro, parsley, and lemon juice. Be sure to leave the chickpeas chunky! Store fresh in our Kangovou Bento Box alongside triangles of sliced pita. Your child will love scooping the delicious chickpeas with the pita wedges! Perfect for picky-eaters and sweet tooths alike! This scrumptious sandwich is made with wholegrain bread, cream cheese, and apricot jam! Make lunch a fruitful funfest by storing in our Kangovou Compartment Plate alongside small servings of grapes, apple wedges, graham crackers, and yogurt! This yummy, yummy meal is a salad in disguise! In our Kangovou cereal bowl, include mixed lettuce, blueberries, strawberries, and feta cheese, covered in a sweet poppyseed dressing! A twist on the classic PB&J, this lunch is a much healthier alternative! Combine peanut butter, honey, and thinly sliced banana on whole grain bread. Serve in our Kangovou Bento Box alongside pretzels for a salty treat! For this tasty crunchy entree, combine crisp bell peppers, hummus, and lettuce in a wheat wrap. Pair with a rockin’ pasta salad that can be prepped the night before: with cooked penne pasta, add sweet vidalia salad dressing and diced bell peppers, then let sit overnight. Pack the pasta and veggie wrap cold in our Kangovou Bento Box! This delightfully colored meal is sure to please your kids! Easily prepared the night before, cook elbow macaroni pasta, mix in pesto pasta sauce, and add fresh broccoli. Cleanly serve this vibrant meal in our Kangovou flat plate! These mouthwatering layers will surprise your child with lunchtime adventure! Layered in our Kangovou cereal bowl, add rice, black beans, diced tomatoes, diced avocados, and diced bell peppers, with a sprinkling of cheddar cheese on top! These fun colors and fresh tastes make lunchtime a blast of flavor! These fresh, crunchy spring rolls are simple and fun to put together! In rice paper, wrap lettuce, cucumbers, rice, and carrots. Serve several of these cute bite-sized treats in our Kangovou Flat Plate! This smorgasbord of flavors is fresh, fun, and crisp! Serve tuna salad with lettuce on a wheat wrap in our Kangovou Compartment Plate alongside small servings of raspberries, blueberries, and celery!